HOFFMAN ESTATES, IL--(Marketwire - April 21, 2010) - According to a recent national survey* conducted by Kmart, nearly 70 percent of Americans have changed the way they shop as a result of the recession. Given the current economic climate where banks have sharply reduced consumer credit card limits, one shopping tool, layaway, is re-emerging in popularity with more than 73 percent of consumers stating that they believe using layaway more often is a smart financial solution that can help them better manage their spending. "Layaway is back -- in a big way," said Susan Ehrlich, president of financial services, Sears Holdings. "This isn't just a trend created by the recession. Rather, the survey revealed what we've believed for some time now -- that layaway, a shopping concept that was embraced by Kmart more than 40 years ago, has emerged as a viable and relevant option for cost-conscious consumers. It's a financial tool that can help families successfully manage their budgets and expenses." The current economic climate has stimulated consumer interest in layaway, but today's shoppers have realized layaway is more than a recession-inspired tool. The majority of consumers surveyed confirmed they are interested in learning more about layaway as a year-round financial planning tool (55.5 percent). Consumers are looking for smarter tools in money-management with more than 80 percent agreeing that they would rather forgo the instant gratification of financing their purchases in favor of using layaway (82.2 percent). According to Ehrlich, the Kmart layaway program has experienced double-digit growth since 2008. In fact, the layaway program at Kmart and at its sister company Sears has resulted in more than three million new customer relationships in 2008 and 2009. "From back-to-school and holiday shopping to one-of-a-kind occasions such as baby showers and Father's Day, we've helped families better plan their spending trips through layaway," she said. 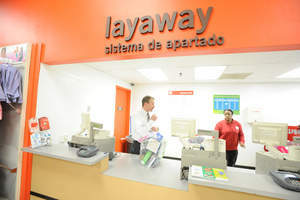 "More than ever shoppers are seeking value in everyday purchases, and layaway creates the financial discipline that allows them to make a payment over a finite period of time. It gives shoppers a sense of accomplishment after completing their purchase plan." Kmart layaway is available year round and allows shoppers to purchase items using an eight-week payment plan. Following a $15 or 10 percent down payment, bi-weekly payments are made for the length of the contract. The initiation fee on all new layaway contracts is just $5. Busy consumers can also visit www.kmart.com to shop using online layaway and manage payments. Cancellation fees may apply, for more information visit www.kmart.com/layaway. Kmart, a wholly owned subsidiary of Sears Holdings Corporation (NASDAQ: SHLD), is a mass merchandising company that offers customers quality products through a portfolio of exclusive brands that include Jaclyn Smith, Joe Boxer, County Living and Route 66. For more information visit the company's website at www.kmart.com or the Sears Holdings Corporation website at www.searsholdings.com. From back-to-school and holiday shopping to one-of-a-kind occasions such as baby showers and Father's Day, layaway at Kmart helps families better plan their spending trips.